50 Laps of Go Karting- Exclusive Offer!! The 'fast gene' has evolved in humans and now we're all geared to love speed. Karting 2000, 27 Froxmer Street, Gorton, Manchester, M18 8EF. Social Circle has managed to grab one AMAZING deal for you! 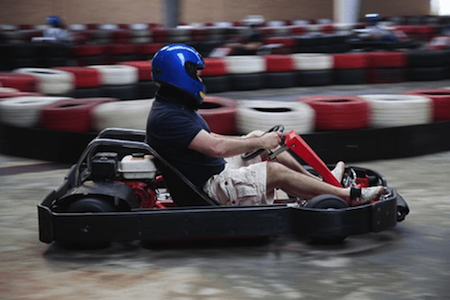 That's 50 laps of Go Karting worth £39.50 for just £7.50 to you in one of the best deals ever featured on social-circle.co.uk. The 'fast gene' has evolved in humans and now we're all geared to love speed. We love fast-food, speed dating, super-powered broadband and fast forwarding adverts too. If you're a speed lover then you're going to love the adrenaline fuelled deal we've found! You’ll be able to whizz round the track to your motorhead heart's content at Karting 2000. You’ll enjoy 50 laps which will give you plenty of opportunity to blow off some steam – so why not get some mates together and see who comes out tops? And in between, enjoy some top notch 'pit lane' downtime. An independent company with winning transport links from both the motorway and the city centre, Karting 2000 offer a comprehensive karting experience. With a Pit Stop Cafe, large screen TV's, pool table and viewing gallery, you’re guaranteed plenty of action on and off track. Balaclavas and gloves available for purchase £4.99 per set. Average time to complete 50 laps is 18-20 minutes. hi, any idea when the bookings for the go karting will be available please?